Step 1 In the bowl of an electric mixer or food processor or by hand, mix the flour, 2 teaspoons salt, the yeast, barley malt syrup and 1 cup plus 2 tablespoons water until the ingredients form a stiff, coarse ball of dough (about 3 minutes if mixing by hand or in a mixer; or 1 minute in a food processor). If necessary, add a little more water. Let the dough rest 5 minutes. Step 2 Knead the dough on a lightly floured surface until the dough feels stiff yet supple, with a satiny, slightly tacky feel, 2 to 3 minutes. If the dough seems too soft or too tacky, sprinkle over just enough flour as needed. Step 3Place the dough in a lightly oiled bowl, cover tightly with plastic wrap, and place it in the refrigerator for at least 1 hour and up to several hours. Keep in mind that the bagels must be shaped before proofing overnight. Step 4When ready to shape the bagels, line a baking sheet with lightly greased parchment paper or a silicone baking mat. Step 5Remove the dough from the refrigerator and divide it into 6 to 8 equal pieces. Form each piece into a loose, round ball by rolling it on a clean, dry work surface with a cupped hand; do not use any flour on the surface. If the dough slides around and won't ball up, wipe the work surface with a damp paper towel and try again -- the slight amount of moisture will provide enough "bite" for the dough to form a ball. When each piece has been formed into a ball, you are ready to shape the bagels. Step 6Using your hands and a fair amount of pressure, roll each dough ball into a "rope" 8 to 10 inches long. (Moisten the work surface with a damp paper towel, if necessary, to get the necessary bite or friction). Slightly taper the rope at the ends so that they are thinner than the middle. Place one end of the dough between your thumb and forefinger and wrap it around your hand until the ends overlap in your palm; they should overlap by about 2 inches. Squeeze the overlapping ends together and then press the joined ends into the work surface, rolling them back and forth a few times until they are completely sealed. Step 7Remove the dough from your hand and squeeze as necessary to even out the thickness so that there is a 2-inch hole in the center. Place the bagel on the prepared sheet pan. Repeat with the other pieces. 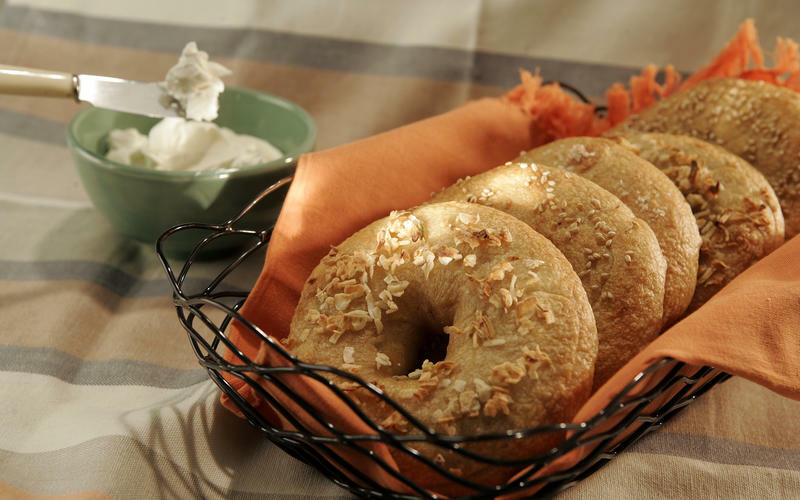 Lightly wipe the bagels with oil, cover with plastic wrap and place in the refrigerator overnight. Step 8Remove the bagels from the refrigerator 90 minutes before you plan to bake them. Fill a large stockpot with 3 quarts of water (be sure the water is at least 4 inches deep), cover with a lid, and slowly bring the water to a boil. When it comes to a boil, add the remaining teaspoon of salt and 1 teaspoon of baking soda, reduce the heat and simmer with the lid on. Step 9Thirty minutes before baking, heat the oven to 500 degrees. In Recipes-list.com we have selected the most viewed recipes from category - Breads . Enjoy the best recipes specially selected for you! Bagels is the right choice that will satisfy all your claims.